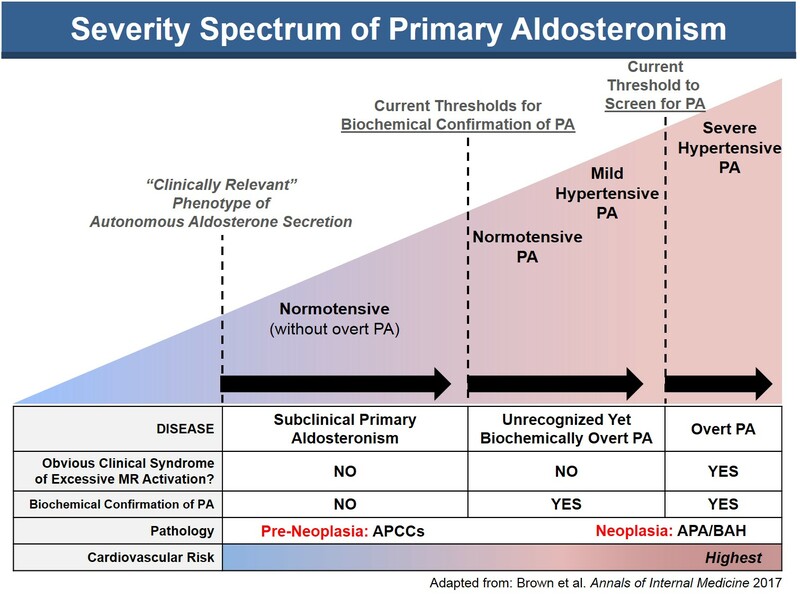 1) Primary Aldosteronism: What is the range of clinically-relevant autonomous aldosterone excess that we should recognize and treat? What are the consequences of not recognizing milder forms of autonomous aldosterone secretion? 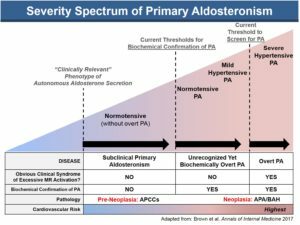 What causes primary aldosteronism? What is the best way to treat primary aldosteronism once it is diagnosed? These are key questions we have investigated, and continue to investigate, using human physiology studies, longitudinal cohort studies, and intervention designs. 2) The Genetic and Environmental Risk Factors for Developing Pheochromocytoma-Paraganglioma Syndromes and Adrenal Cortical Carcinoma: What genetic and environmental exposures contribute to the pathogenesis of pheochromocytoma and adrenal carcinoma? How can genetic findings inform our understanding of pathogenesis and treatment? Our research has implicated hypoxia, and mutations that cause cellular pseudohypoxia, as a risk factors for developing chromaffin cell tumors and adrenal carcinoma. 3) The Cause and Consequences of Adrenal Neoplasia: Why do adrenal tumors develop? What are the metabolic and cardiovascular consequences once adrenal tumors develop? How can these be prevented or mitigated? Our lab has identified unique risk factors for the development of adrenal neoplasia and has identified cardiometabolic disorders that are associated with having adrenal tumors. Lopez et al. 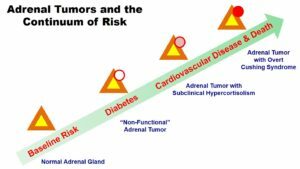 “Non-functional” Adrenal Tumors and the Risk for Incident Diabetes and Cardiovascular Outcomes. Annals of Internal Medicine 2016. Hao et al. The Lateralizing Asymmetry of Adrenal Adenomas. Journal of the Endocrine Society 2018. 4) Improving Quality of Life for Patients with Addison’s Disease (primary adrenal insufficiency) and Congenital Adrenal Hyperplasia: One one hand, patients with adrenal insufficiency can be treated with hormone supplementation. On the other hand, despite this capability, many patients are not able to achieve the quality of life they desire. How can we tailor the treatment of adrenal insufficiency to improve individual patient quality of life? 5) The Interaction Between Adrenal- and Calcium-Regulatory Hormones: Reciprocal interactions between these two hormonal systems exist. Does vitamin D influence renin-angiotensin system activity? Does aldosterone influence parathyroid hormone activity? What role do these interactions have in normal physiology and in pathophysiology? • Vaidya A et al. Vitamin D3 Therapy Corrects the Tissue Sensitivity to Angiotensin II Akin to the Action of a Converting Enzyme Inhibitor in Obese Hypertensives. JCEM 2012. • Brown JM et al. Human Interventions to Characterize Novel Relationships Between the Renin-Angiotensin-Aldosterone System and Parathyroid Hormone. Hypertension 2014. • Vaidya A et al. 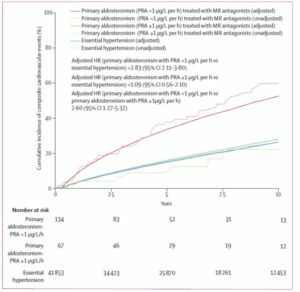 Hypertension, Anti-Hypertensive Medications, and Risk for Incident Primary Hyperparathyroidism. JCEM 2015. • Brown JM et al. Aldosterone, Parathyroid Hormone, and the use of Renin-Angiotensin-Aldosterone-System Inhibitors. JCEM 2015. • Zaheer S et al. Parathyroid Hormone and the use of Diuretics and Calcium-Channel Blockers. Journal of Bone and Mineral Research 2016.